Build important relationships with key players on Capitol Hill. Congressional staff aren't just your way through a member's door; they are the door. How do you get results from these vital, behind-the-scenes individuals? Learn how to write a "one pager"
You learn from a former Member of Congress and find out what tools help persuade staff. How Federal Agencies Can Work Effectively with Congress and Its Staff and How to Work the Hill Like a Pro and Making the Most of a Site Visit with a Member of Congress and Strategies and Tactics That Will Help You Impact Congressional Action. 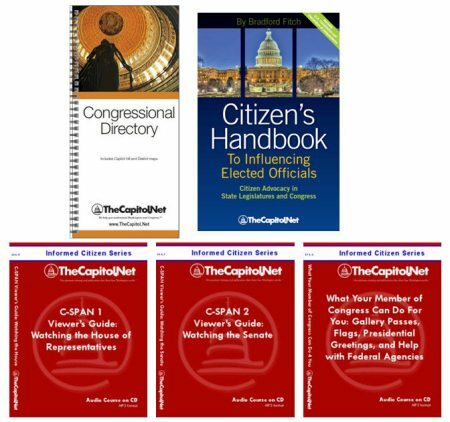 Buy all four (4) Capitol Learning Audio Courses on audio CDs. Total run time: 304 minutes. MP3 format. CD includes MP3 audio file and course materials in Adobe PDF . Includes course materials, FREE copy of "Persuading Congress" and FREE shipping in the US. These Audio Courses are sold with a Limited License. This session sets the context by defining the political environment in the current Congress, and discussing the congressional members and staff who work there. Specific tools and techniques that you can use to communicate most effectively with members and staff are described, also addressing how you need to adjust your communication at the end of one Congress and the beginning of another. The instructor provides practical suggestions for making the most of meetings with staff, including how to set-up a meeting, who should attend, and how to follow-up after the meeting. Learn the importance of and how to write a "one pager". The session provides important "do's" and "don'ts" of interacting with the Hill and building good working relationships between Congress and outside interests. A former member of Congress provides insight into the many pressures and responsibilities that a member must balance in day-to-day decision-making and policy-making. She then discusses how members rely on staff to deal with the busy Capitol Hill environment, and how outside interests can communicate effectively with staff and members in this environment. Discussion includes how members set up their offices, what they expect from staff, and how staff influence members. A panel of congressional staff members discusses the positions and responsibilities of committee and personal staff, the organization of congressional offices and the work environment on the Hill. They focus on what staffers need or expect from outside interests, the most effective forms of communication, and how to build strong working relationships with staffers. The staffers also provide their insights into the dynamics of Congress. This course and any of its topics are available as custom, on-site training anywhere in the United States. 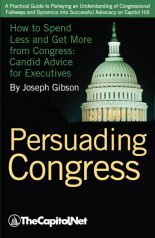 Course Materials Course materials include the Training Edition of Persuading Congress. "This program has provided me with confidence to present my issue to the congress member or staffer with accuracy and within a short timeframe." "Good variety of speakers, beneficial to have broad perspective." "Great tips on how to engage and develop a positive relationship with members and their staff." Our faculty for this course includes registered lobbyists, former members of Congress, current Hill staffers, and other Washington experts.